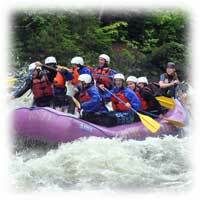 Maine White-Water Rafting Adventure Vacation Trip Packages! We do not give out email information and you can opt-out at any time! Breathtaking scenery as you paddle under Mt. Katahdin in Baxter State Park. Guaranteed whitewater through dam controlled releases every day (May through September). No experience necessary, no minimum group size. Overall Class 4+ river (on a 1-6 scale). Rapids range from class 3-5 (on a 1-6 scale). Paddle the lower section in the morning (class 3 & 4), and then the upper gorge (class 4 & 5) in the afternoon. The most technical whitewater in Maine (class 3, 4 and 5 water). 1 & 2 day trips available, as well as a wide range of camping & lodging packages. Meeting location - 9:00 am at the Big Moose Inn (see the Maine map on our Directions page for additional information). We recommend checking in 20-30 minutes prior to the meeting time. Trips do not wait for late arrivals. No refunds, credits or transfers for late arrivals. Minimum age - 12 years (Full River Trip); 8 years (excluding class 5 sections).